ww2dbaseManuel Luis Quezon y Molina was born in Tayabas (now Aurora); a mestizo, his parents were Spanish and Filipino. After fighting alongside of fellow nationalists against American occupation troops, he completed his studies at the University of Santo Tomas and passed the bar exam in 1903. He entered government service after receiving his law degree. He became the governor of his home province of Tayabas in 1906, elected to the first Assembly in 1907, and served in Washington as one of the Philippines' two resident commissioners to the House of Representatives in 1909 until 1916. After he returned to his country as the Philippines' Senate President, and held the position until 1936 when he sworn in as the nation's first elected president. Although he was the first official president of the Philippines, some considered his predecessor Emilio Aquinaldo the first president, who held the title but did not receive international recognition at the time. "after nine weeks of fighting not even a small amount of aid has reached us from the United States. Help and assistance have been sent to other belligerent nations,... but seemingly no attempt has been made to transport anything here.... [T]he United States has practically doomed the Philippines to almost total extinction to secure a breathing space." ww2dbaseRoosevelt, perhaps as expected, denied Quezon's request for independence. ww2dbaseReluctantly, Quezon boarded the submarine USS Swordfish on 22 Feb 1942 and headed for America, with him a box given by MacArthur, filled with the American's medals, photos, marriage certificate, and other personal items he did not want to risk Japanese capture. Quezon knew that MacArthur was expecting a final showdown against the Japanese, and his friend would risk death for the Philippines. Before he boarded the submarine, Quezon slipped off his signet ring, and placed on MacArthur's finger. "When they find your body," Quezon said to his Field Mashal, "I want them to know that you fought for my country." Dwight Eisenhower, who served under MacArthur in Philippines immediately before the war, said that Quezon "clearly understood all the reasons why more effective help could not be rendered at that moment, but he knew the Philippines would again live under its own flag. From this conviction he never waivered." ww2dbaseIn the United States, Quezon continue to fight for his country as a member of the Pacific War Council. He also worked on his autobiography, which was published in 1946 under the title The Good Fight, after his passing. ww2dbaseQuezon died in Saranac Lake, New York, United States from tuberculosis on 1 Aug 1944. After being interred twice, he rests today at the Quezon Memorial Circle in Quezon City. On his death bed, he wrote "my beloved countrymen, every day the hour of our liberation is drawing closer. Keep the banners of your faith flying. We are on the onward march to victory and freedom." He passed away before hearing the news of MacArthur wading ashore at Leyte. 19 Aug 1878 Manuel Quezon was born. 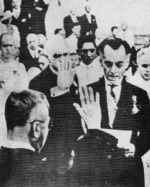 30 Dec 1941 Manuel Quezon was sworn in as the President of the Commonwealth of the Philippines at the west entrance of the Malinta Tunnel on Corregidor, Philippine Islands. 22 Feb 1942 American submarine Swordfish evacuated Philippine President Quezon and his government. 1 Aug 1944 Manuel Quezon passed away. Hello, Is it possible to add other World War 2 stories or experiences from other sites such as: http://worldwar2-romasanta.blogspot.com/ ?? I appreciate if you can assist me from my concern! More power to your site! The information that Roosevelt denied independence was very inaccurate. 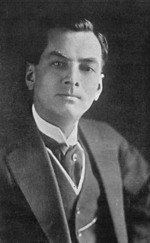 Quezon threatened to order his troops to stop fighting as he was trying to get US relief and troops to the Philippines. Roosevelt promised to send aid, but that it would take time, and regardless of what happens, US soldiers who fight and die to defend the Philippines from the Japanese. Years later Quezon even wrote and spoke of how he felt so ashamed that he himself was less willing to fight for his home country than the Americans and it was at this point that Quezon chose to order his troops to stand their ground, and he returned to the US at FDR's recommendation.